Dr. Themistocles (Themy) Sparangis is an Adjunct Professor at the University of Southern California’s Rossier School of Education. He is responsible for IT Customer Services for the Los Angeles Unified School District and reports directly to the Chief Information Officer. The IT Customer Services Group provides the repair and maintenance of local area networks, voice and radio communications systems, security systems, computing devices and associated software, as well as IT helpdesk services for the schools and offices in the District. 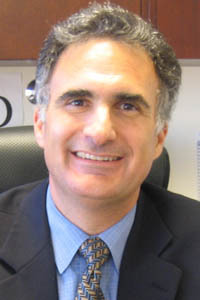 Dr. Sparangis obtained a Bachelor of Arts degree in General Physics from the University of California, Los Angeles. He continued his graduate studies at the University of Southern California, where he obtained a Master of Science degree in Teacher Education and a Doctorate of Education, specializing in International Education. He is a credentialed Teacher in Secondary Physical Science, having taught Advanced Placement Physics, Physics, and Physical Science in the Los Angeles Unified School District. He also holds an Administrative Credential issued by the State of California. Dr. Sparangis is a member of Phi Delta Kappa (PDK), the International Society for Technology in Education (ISTE), and Computer Using Educators (CUE), The Consortium for School Networking (CoSN) the National Association for Media Literacy in Education (NAMLE), EdLeader21, and the International Council for Online Learning (iNACOL).